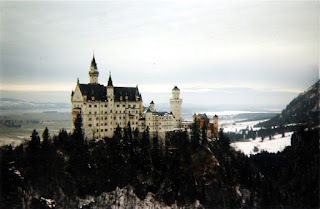 This is a picture I took of the castle Neuschwanstein in Bavarian Germany when I was in the area in 2001. The photo was taken from the "marienbrucke" which is a rope bridge that is in the mountains across from the castle. This castle was the inspiration for the Sleeping Beauty Castle in Disneyland.